We are now organizing a Special Section on Emerging Privacy and Security Issues brought by Artificial Intelligence in Industrial Informatics of IEEE Transactions on Industrial Informatics due on May 31, 2019. 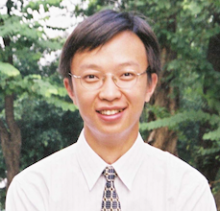 Hong-Ning (Henry) Dai is an associate professor in Faculty of Information Technology at Macau University of Science and Technology. He obtained the Ph.D. degree in Computer Science and Engineering from Department of Computer Science and Engineering at the Chinese University of Hong Kong. He also received the B.Eng. and M.Eng. degrees in Computer Science and Engineering from South China University of Technology. Henry worked in Department of Information Engineering at the Chinese University of Hong Kong and the Hong Kong Applied Science and Technology Research Institute after his Ph.D. study. He also holds visiting positions at Department of Computer Science and Engineering in the Hong Kong University of Science and Technology, School of Electrical Engineering and Telecommunications in the University of New South Wales, Hong Kong Applied Science and Technology Research Institute, School of Data and Computer Science in Sun Yat-sen University (Guangzhou, China), School of Computer Science and Engineering in University of Electronic Science and Technology of China, School of Mechanical and Automotive Engineering in South China University of Technology, respectively. His research interests include Internet of Things, Big Data Analytics and Blockchains. He has published more than 90 peer-reviewed papers in refereed conferences and journals, including IEEE Transactions on Industrial Informatics, IEEE Transactions on Vehicular Technology, IEEE Transactions on Intelligent Transportation Systems, IEEE Transactions on Computational Social Systems, ACM/Springer Wireless Networks, IEEE INFOCOM, IEEE ICC, IEEE GLOBECOM, IEEE WCNC, IEEE PIMRC, ACM WUWNet, IEEE LCN, IEEE WoWMoM, IEEE ICCS, IEEE ISSNIP, ICCS, etc. He has 1 ESI highly-cited paper awarded by Clarivate Analytics. 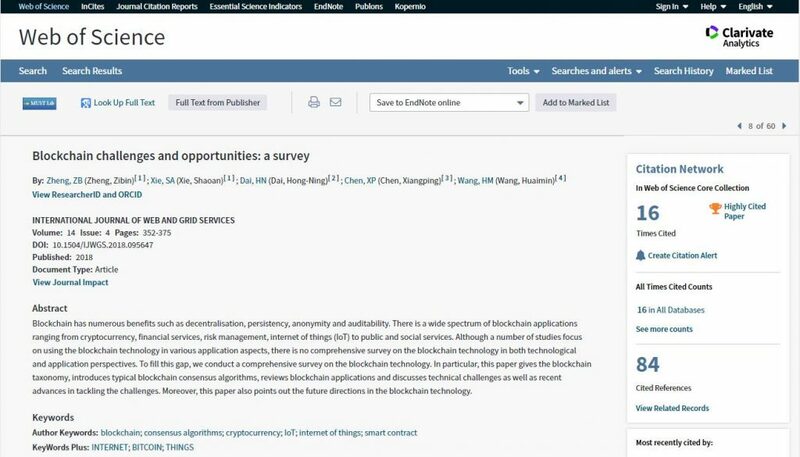 He has served as a guest editor of IEEE Transactions on Industrial Informatics, editorial board members in International Journal of Industrial Engineering Computations, International Journal of Wireless and Mobile Communication for Industrial Systems and International Journal of Data and Network Science. He also served as conference staff members to co-organize a number of conferences, including IEEE ICCS, ACM MobiHoc, IEEE ANT, IEEE SCC, IEEE GCC and CIAPR, etc. Meanwhile, he is a Founding Member of of the IEEE Special Interest Groups (SIG) on Intelligent Internet Edge (IIE) at IEEE. He is a winner of BOC Excellent Research Award of Macau University of Science and Technology. He is also the holder of 1 U.S. patent and 1 Australia innovation patent. He is a senior member of the Institute of Electrical and Electronics Engineers (IEEE) and a professional member of the Association for Computing Machinery (ACM). His Ërdos Number is 5. Highly Cited Papers are papers that perform in the top 1% based on the number of citations received when compared to other papers published in the same field in the same year. 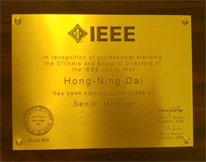 Senior Member is IEEE’s distinguished membership grade approved and assigned by the IEEE Admission and Advancement Committee only for IEEE members with 10 years in their profession and at least 5 years of significant technical or professional performance. 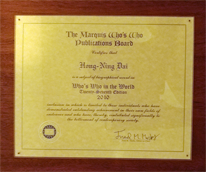 Founded in 1899 by Albert Nelson Marquis, Marquis Who's annually selects a set of outstanding biographees who are featured on special recognition in their disciplinaries or specializations. 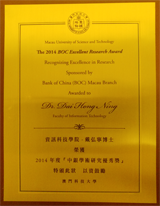 With the sponsorship from Bank of China (BOC) Macau Branch, Macau University of Science and Technology (the University) sets up the BOC Research Excellence Award (the Research Award) to recognize the excellence in research here and to enhance the quality of research in the University. There will be one award annually in each of the five disciplinary clusters as follows: (1) Humanities and Creative Arts, (2) Social Sciences, Economics, and Management, (3) Mathematics and Natural Sciences, (4) Biological and Medical Sciences, (5) Technology and Applied Sciences. IEEE INFOCOM student travel grant (STG) is sponsored by the IEEE Communications Society. STG is awarded to those Ph.D. students who are good academic standing at the given institution.